Carson – O Hei There! Came here on a random Saturday night with Eugenia and Linh-Nam because we were in the area buying groceries from Marukai in Gardena and Linh-Nam needing to go home for a bit (in Harbor City). Apparently it’s a well-received restaurant on Yelp, and Eugenia the Yelp Elite reiterated that sentiment. Linh-Nam ordered pho, Eugenia ordered a vermicelli, and I ordered a rice dish (pictured above). To be specific, it was the King Way Combo ($9.75), which includes: pork chop, beef, pork, chicken, shrimp, egg quiche, shrimp wrapped, and fried egg. We also split an order of egg rolls. Did I enjoy the Pho King food? It was okay. 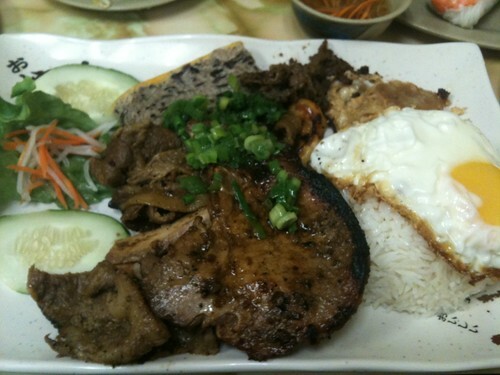 I’m no Vietnamese food expert, but everything just seemed so…plain. I’m used to the bold flavors that are ever so present in most Vietnamese dishes, and this plate of food was more along the lines of a Viet bento box your mom might pack for your lunch at school. To nitpick, I can say that all the meats tasted one-note, and that the rice wasn’t the usual broken rice. It was still filling though (obviously, given the size), and overall it wasn’t too bad. But it wasn’t close to what I’ve come to expect from Vietnamese food, and it was a bit pricier too. Still, it might be better than some of the nearby options in Carson, seeing how much of a culinary haven Carson is.